The number of trains that run on time in the UK has reached its lowest level in a decade, figures show. The Office of Rail and Road said 12.3% of trains - nearly one in eight - were not on time last year - the worst performance for a 12-month period since the year ending September 2006, at 12.5%. More than a quarter of Govia Thameslink Railway services, owner of strike-hit Southern, were not on time, it said. 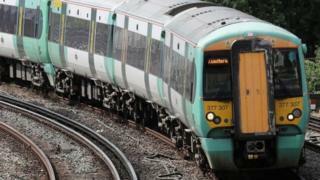 Rail operators said strikes had hit punctuality in south-east England. But elsewhere, punctuality was at a "record high", said the Rail Delivery Group, which represents train operators and Network Rail. The Rail, Maritime and Transport union announced on Wednesday that its members on Southern will walk out for 24 hours on 22 February in the row over guards' roles on trains. And on Thursday, it was announced that drivers' union Aslef had rejected a deal with Southern rail that would have ended their dispute. The rail industry counts trains as being on time if they arrive at their terminating stations within five minutes of their schedule for commuter services and within 10 minutes for long-distance routes. Lianna Etkind, of the Campaign for Better Transport, said the figures showed that train firms were "still delivering a very lacklustre service" despite "sky-high prices". The figures also showed 3.8% of trains across Britain were cancelled or at least half an hour late last year. Ms Etkind said the government needed to give passengers "an affordable and reliable rail service". "They should begin by ensuring that rail contracts give stronger incentives for punctuality, reliability and passenger service, as has successfully happened on London Overground and Merseyrail," she said. She also said there should be "investment into those worn-out parts of the network which cause delays". A spokesman for the Rail Delivery Group said: "In London and the south east, a combination of congestion on the network, prolonged strike action and disruption while major upgrades take place is hitting punctuality. "Across the railway, train operators and Network Rail are working together every day to deliver more reliable and safe services for passengers."